When lives are on the line, you need the smartest people, the latest technology, the right equipment and the best facilities. Designing healthcare facilities that make an important contribution to patient outcomes has become a highly specialised field where experience and the ability to grasp complexity are crucial. For health project owners, access to these specialists can make all the difference. WSP | Parsons Brinckerhoff Health Sector Lead Damien Kenny said the rapidly evolving nature of healthcare requires planning of facilities that are in tune with today’s demands but adaptable to tomorrow’s needs. “To satisfy this demand, projects are increasingly complex; more specialised, and require greater levels of knowledge. Likewise, healthcare design and delivery teams must move towards a specialist approach with global teams sharing best practice with their local offices,” he said. International services firm WSP | Parsons Brinckerhoff is Australia’s leading healthcare engineering consultancy and provides a comprehensive suite of expert skills and consultancy services encompassing planning, design, delivery, and cost control. Mr Kenny believes new models of healthcare are forcing the industry to fundamentally re-examine the nature of hospitals and the services they provide. “We see a shift away from the traditional, volume-based centres, where each hospital provides a full range of services, to more specialist care centres focused on related groups of conditions,” he said. The Cleveland Clinic is recognised as a world leader in this approach. 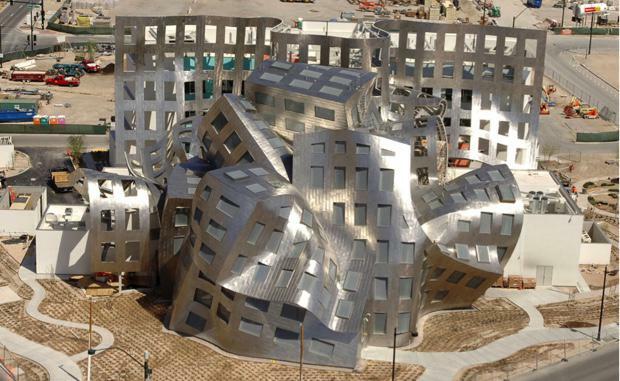 Their new Lou Ruvo Centre for Brain Health in Las Vegas (pictured) is one of the best examples of this modern take on healthcare. As digital and IT systems take a quantum leap forward, WSP | Parsons Brinckerhoff envisages a move away from silo-based systems to more open platform technologies. The creation of real-time records of a patients’ medical history (such as eHealth records in Australia), allows hospitals to share information on national basis, drastically reducing administration and processing times, and providing faster patient prognosis. Mr Kenny believes the challenge for designers is to utilise their knowledge of the latest hardware and software to ensure systems are flexible and future proofed. WSP | Parsons Brinckerhoff understand that every dollar saved in project delivery with creative solutions is another dollar that can be invested in enhancing the user experience for patients, staff and visitors. This realisation has meant that the procurement methods for the design and construction of healthcare facilities are also evolving. “In Australia, the industry has begun to favour alternate methods of project delivery across a broad range of projects, with each approach providing ways to offset client risk, improve product, and offer the potential for faster delivery,” he said. The combined global strength of WSP | Parsons Brinckerhoff provides a new level of confidence for health project owners. Bringing global expertise to local projects in Australia the WSP | Parsons Brinckerhoff team understands the rigors and demands faced by the healthcare sector.